The government has issued a public reminder that, starting today (September 1), several categories of visitors arriving in the British Virgin Islands will be charged $10 as an Environmental and Tourism levy. It again noted that the new fee will be used to protect the environment. “It will be applied towards activities related to environmental protection and improvement, minimizing climate change, maintaining developing tourism sites and other tourism activities,” said a release from the Government Information Service. It explained how the fee will be collected. The government also reminded the public that the legislation makes provision for some categories of persons to be exempted from paying the new fee. – Persons exempted by the Minister by Order published in the Gazette. Cruise ship passengers are included in this category. 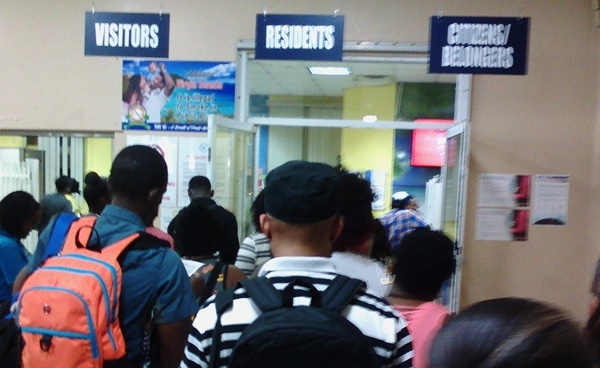 The government said other exemptions include visitors arriving in the British Virgin Islands on a second or subsequent occasion in the course of the same visit, persons in transit who do not leave the airport or dock when they arrive, crew of vessels as well as cruise passengers arriving via cruise lines. “Belongers residing outside of the territory are not required to pay the levy, but must provide the immigration officer with their Belongers Card or British Virgin Islands passport as proof of their status,” the government further said. The Environmental Protection and Tourism Improvement Fund Act 2017, which facilitates implementation of the new fee, was passed in the House of Assembly on June 9. It was gazetted on June 12. More monies from the poor islands expats. what next?? More money to pay bloated civil service salaries! Take the money away from the tourist, then pay government employees to try and recruit more tourists to come and pay these fees. Huh????? Street talk, no real knowledge of what is happening in the civil service. It’s a tax to protect the environment and cruise ship passengers are exempt? What hypocrisy! Once again we are chipping away at the goodwill of our best class of visitors — those that actually stay with us and used to want to come back whenever they could. And to the writer, why is the fact that cruise ship passengers are exempt the last little note in your list of exemptions? It must be the effects of the pollution from all the heavy bunker oil fuel they burn in our waters and the sewerage they dump in the seas. There is no need to collect an environmental levy from the heaviest polluters to visit our shores as they will just go somewhere else once they ruin our environment. People who come to charter a yacht for a week should be exempt like the ship cruise passengers. Yacht charterers are spending a lot more and are already being “soaked” by the BVI “Cruising tax”. Enough already, or we will go elsewhere. Idiotic. Further annoy incoming tourists who have probably just waited 30 mins to an hour to get through immigration. Cause lines and waiting. Take cash which can be easily stolen. Raise next to nothing. Immigration in the US takes much longer. Sometimes they have you sit on a plane while dogs roam through it, but people like to complain to make it seem like the BVI is the worse of the bunch. Far from the truth. I have travelled all over the world and waiting on immigration is nothing new to the BVI. right there in STT we sometimes have to wait for them to start up their computer as if they do not know the schedules of the ferries, then they have to be taking photos and no one complains, because they know that the consequences of the complaints could be rather unpleasant. THEY ALWAYS TALK ABOUT GOING PUERTO RICO IN LONG LINE AND THEY CANT SAY A THING OR MAKE NOISE ,AND STILL THE COUNTRY SAME WAY AND THEY STILL KEEP GOING.HMMMMM!! I’ve never waited 30 minutes in immigration. Usually about 10. No big deal. The US is MUCH worse and they photo you and take your fingerprints like a criminal. I simply don’t go there any more. BVI is much better. So starved for cash this country is, eh? What’s so hurtful, is that with so many overrunned projects, mismanagement, and corruption, this country is now in a position now looking for others, not of Belonger heritage, to fund the preservation of flora and fauna. Lets see:Lots of overgrown grass,trash strewn in many areas, oceanic trash in strategic locations; areas I feel have not been given the real attention that should be given for a major tourist hub, should be the areas in which such monies are spent! While I welcome any additional help to preserve our territory, unless there are monthly reports of monies collected and in which areas of environmental concerns those proceeds were used, Im afraid, like so many other “taxes”, it will get shuffled to areas not of immediate environmental concern! I agree with you about the trash that needs to be cleaned up and thatthe money needs to be spent on the thing it’s raised to do. But since we Belongers and BVIslanders cry like babies when asked to pay to clean it up, who else is going to pay if not the visitors? ALL THIS IS GOING TO DO IS RUN AWAY TOURIST FROM COMING HERE TO VACATION AND WE WILL LOOSE CORN AND HUSK.FIFTY DOLLARS IS TOO MUCH FOR DEPARTURE TAX WHAT THE FORMER GOVERNMENT WERE THINKING.THEY WERE TALKING ABOUT HOW THEY COMING IN THROUGH THE USVI NOW THEY GIVE THEM THE GREEN LIGHT TO COME THROUGH THE USVI. Not very thought out, the people that causes the most harm are exempt? clueless people must have done this,this is embarrassing in the real world. The authorities in the BVI are probably trying to make the tourist board obsolete. They are lobbying for overnight tourism, but it seems like the aim is to become a cruise destination only. what a tactless way of collecting taxes. Another reason I regret voting NDP 4 years ago. VIP – pls find another way to collect this tax or revoke it altogether. Even if you add $5 to everyone’s entry and add it to the plane ticket so its hidden and not a slap in the face. We gotta come better than this. You prefer it to be hidden! So the charter guest that is here for two weeks will spend $1000.00 at the grocery store, $1500.00 at the liquor store, then another $1000.00 in restaurants and bars, then $500.00 on mooring fees, and finally a few bucks more on souvenirs. All of that is on top of the thousands spent to charter the boat. Yet these guests, who appreciate and love the BVIs as much as any belonger, are taxed while the cruise ship guest, who spends virtually nothing, is exempt. Brilliant! Yes please review, those who are not contributing to NHI are accessing private care instead of public care. @Wow,just Wow. Sometimes we spend more than the figures you quoted. Is it fair, NO. Sometimes I feel that the BVI only see Tourist as cash cows. I took a Charter in ST.Thomas and I end up spending less. I don’t get it. Tortola has every ingredient to become a world class sailing destination and it keeps shooting itself in the foot. Sailors everywhere are waiting for one area to totally distinguish itself from every other sailing destination in the world. Tortola has it all: weather, wind, water, and beautiful scenery. Take a little pride in what you have and clean it up! Distinguish your island from all others and watch the vacationers flock it. The $600-$800 plane ticket to get there dwarfs the $10 charge. Charge the money, just spend it wisely. The first paragraph said starting today September 1st.